Hi guys! An early Happy Chinese New Year! Been really busy catching up my job for the CNY holiday preparation and also to catch up on the time spent holiday-ing in Bali. I just had the best experience in my life in Bali, which I will blog about it soon! 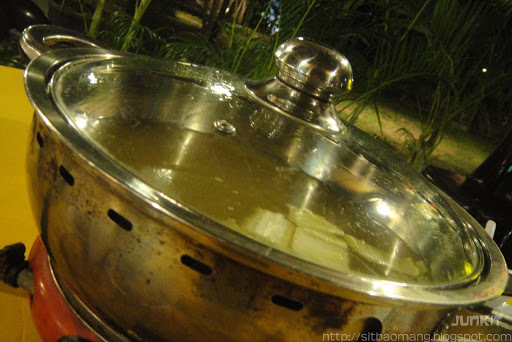 Back to the *slurps* food that I would like to share today, I guess almost everyone of you had at least heard of or look into some sort of food introduction on this famous place for steamboat. Owned by our very own talented veteran Patrick Teoh; who also runs the blog Niamah!! which I loved to read as it touches on issues that I always care of. 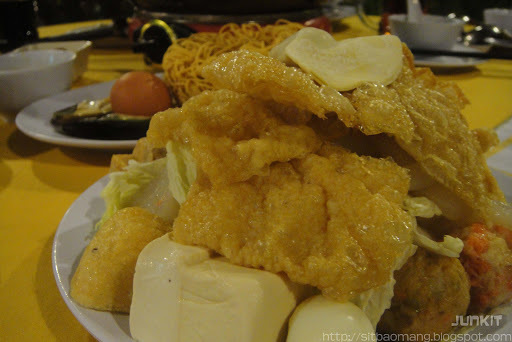 1 x Village Steamboat Set - the lius, fishball, fu zhuk etc. There are also other sets which substitutes some seafood with meat; and also sets that are larger in portion with fresh fish meat like pomfret and snapper thrown in too. 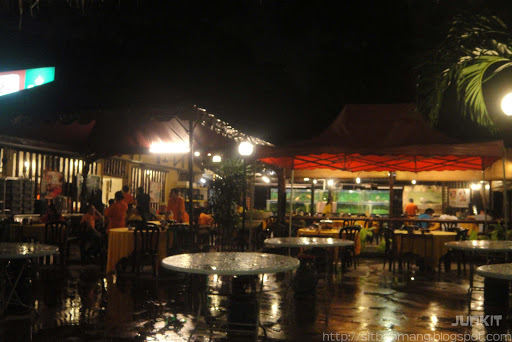 More detailed list and pricing could be seen from Damansara Village's blog. There's only 1 soup base here - the clear soup. It's pretty bland and depends on the fresh seafood thrown in to get really sweet at the end of the session. A recommended upgrade is the Village Drunken Pot; which you will need to add RM12 if I'm not mistaken. Chinese wine with herbs are are added into the soup; making this a hit with chinese wine dishes lovers! I only tried this on my 2nd visit, too bad! Really liked this one as I'm practically drinking the soup non stop after the upgrade. Some fried onions, and great accompanying chili to dip in. I still like my seafood with minimal dipping sauces though. 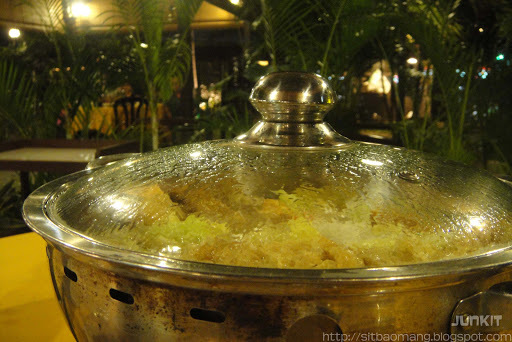 The Village Steamboat Set - just this alone could feed 2 pax. Their fish products like fishballs and fu zhuk are not those shopping market quality type. Pulau Ketam perhaps? 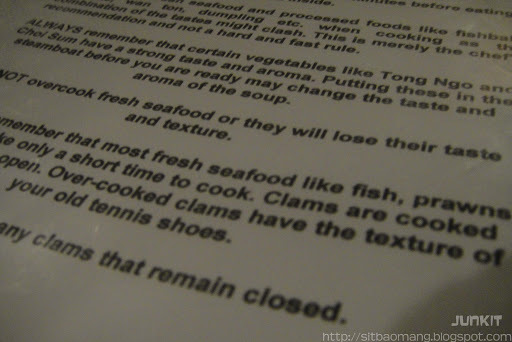 There's also 2 mussels, an egg and a piece of 'Yee Mee' prepared. The Flower Crabs. Although flower crabs are not meaty itself, it is famous for lending it's sweet flavor to boil soup. 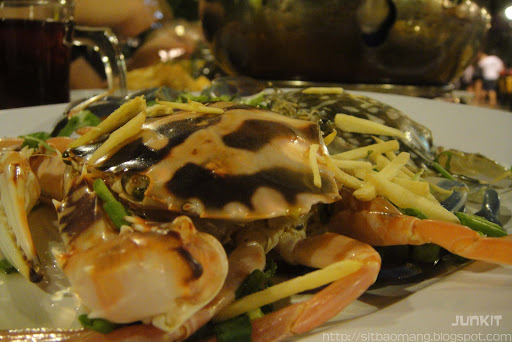 Nevertheless, the crabs here are fresh to my liking with bouncy enough meat texture. Giant Clams. 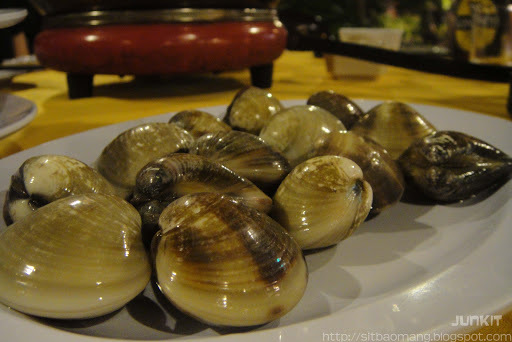 These gigantic clams taste sweeter and has better texture than it's smaller size cousin. Simply dump in a few, and check if it's open after 2-3 minutes. Should immediately eat it after the shell opens up to avoid texture changes. As Patrick Teoh says, like your texture of your old tennis shoes. Niamah!! 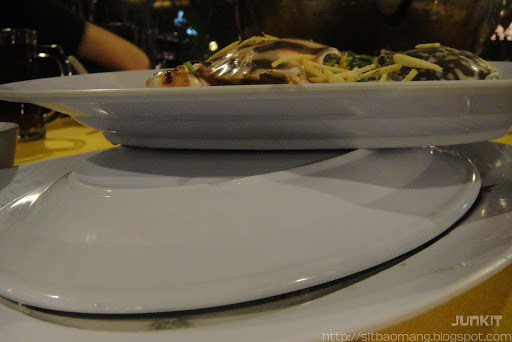 When this particular dish appeared, I was thinking why the hell are they covering the top of the plate with another stacked plate. It turns out, live prawns are contained inside. 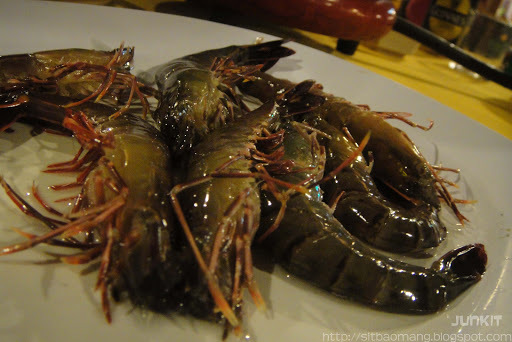 Damansara Village really brings 'live' to a whole new level, with really jumping, alive prawns grasping for air. For first timers, giggles and shock are expected, lol. Anyway, seafood couldn't get any fresher than this, and yes, the prawns do taste better a lot, albeit the cruel cooking method. 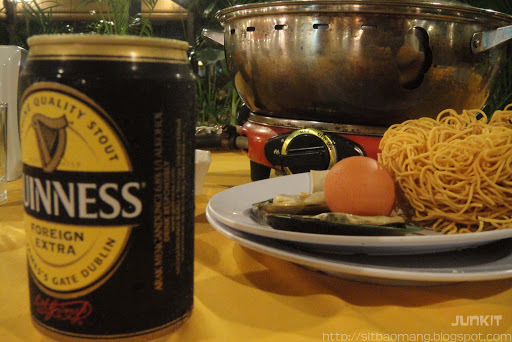 There's really no other method to enjoy a rainy night but with a good meal of piping hot steamboat downed with a good Guiness stout! 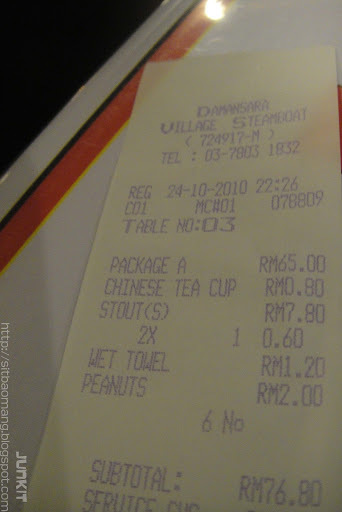 The bill for the both of us came up to RM76.80, not bad for a once in awhile splurge. The pretty comfy environment with personal huts seating; or opt to sit inside. My only complains about the al fresco seats are the mosquito! Especially on a rainy night! Overall, I would definitely return! 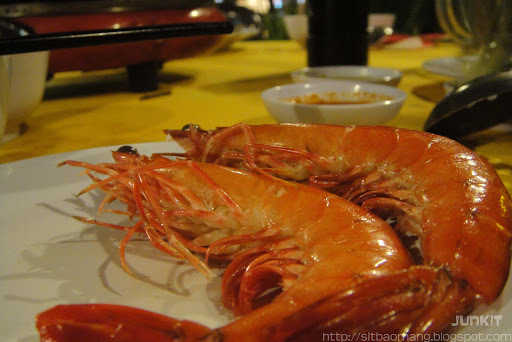 Although much pricier, but the seafood are definitely the next freshest thing other then fishing for your own seafood. 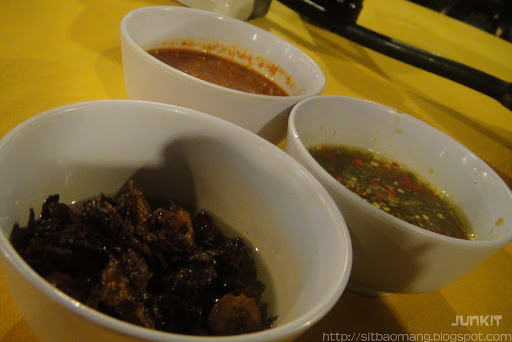 I admittedly do miss the superb Herbal Drunken Pot soup base, too!